If you think the mobile workforce is in the minority, take another look. Even if you’re office-based, you’ve almost certainly checked your emails on your smartphone. You’ve logged on remotely to your company network to securely download a document. Or you’ve joined a conference call on your tablet. By now, nearly every UK business has enabled or considered enabling employees to work remotely – whether from 9-5 or just while they’re out on the road. Mobile is increasingly the default way we work, and it’s happening fast. In fact, by 2020, mobile workers will make up the majority of the workforce. Whether you are a new SME or an established enterprise, the growth of mobile working is good for businesses of all sizes. It can limit employee absences, increase efficiency and productivity, enhance customer service, and even help you save money. It can net better employees by eliminating location requirements and widening the pool of applications. It even has a positive impact on employee satisfaction, providing staff with flexibility and facilitating a far better work/life balance. Most importantly, mobility plays a critical role in digital transformation, which has the potential to open up even greater levels of both productivity and security across all sectors. As UK businesses continue to embrace the rise of the mobile workforce, there is one important question: how can you make sure your infrastructure matches the ever-changing requirements? In this article we take a look at this question through the lens of your print support – showing how a smart approach can help you harness the incredible power of mobile, while balancing both productivity and ease of use with security and control. Before tackling the proposed evolution of your print support, it is useful to take a step back and consider the ongoing changes to what you are printing. In today’s digital age, we need to redefine our concept of what a ‘document’ now looks like –moving from a physical object, to something that consistently shifts between the paper and digital worlds – and adapt how we manage it accordingly. Take a contract, for example – nowadays it starts life being accessed and completed online, then gets printed out for signature, before finally being scanned and made digital again. Managing these so-called hybrid documents requires a lot more attention from you on how documents get created, moved around and changed as employees and customers interact with them. For the mobile workforce to succeed, employees need the ability to access and print documents anywhere, at any time, on any device. While printing is certainly important, to the above point, it now forms part of a much bigger picture which should encompass not only document output, but the process or workflow behind it – the ‘how’ as well as the ‘what’ of your print function. The end goal is to design a combined strategy that makes it easier to get things done. When considering current processes, you might, for example, decide that it makes sense to replace paper forms with mobile forms so employees can collect data while they’re on the move. Not only will this enable quicker information entry into your systems, but by analysing the process(es) around the forms, you can learn when in the workflow employees may need to print, what path the document takes, as well as where inefficiencies lurk. You can then address these issues as part of your broader mobile strategy. Of course, for any new process to work, employees must use it in the first place – something that isn’t always a given and can be overlooked by organisations to their cost. After all, what is the point of enabling a more mobile print solution if no one takes advantage of it? For this reason, ease of use has a vital role to play in encouraging the adoption of mobile solutions. But what does this actually look like? For mobile users, printing should be push-button simple, with no complex configuration or manipulation i.e. no printer driver download. There also needs to be a quick and intuitive way to set preferences and select media. In practice, printing a document from your smartphone should be as easy as sending an email. Additionally, you want a solution that’s cross-platform, with a mobile app for iOS, Android and Windows devices, and that can handle large or complex files (spreadsheets, PDFs, presentations). The bottom line is that printing on the move should be as straightforward as printing in the office. There is no doubt that the mobile revolution is already in full swing, with over 8 billion devices around the world and an expected 11.6 billion by 2021. This brings tremendous opportunities for organisations of all sizes to be more agile, productive and successful. But with those opportunities come some big challenges, as they attempt to adapt their operations and support structure to accommodate this new way of working. A comprehensive mobile strategy for your business should incorporate both document processes and mobile workflows – and establishing both is easier than you think, with the right support. Mobile and cloud technologies have revolutionised the way we store and share information, opening up a whole new world of possibilities. 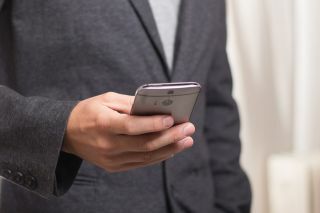 By employing the right mix of devices, connectivity, and processes you can harness the power of mobility to boost your business, starting right now.